The Attachment Therapy Companion: Key Practices for Treating Children & Families by Arthur Becker-Weidman, Lois Ehrmann and Denise H. LeBow, revised in 2012, and available through the Association for Treatment and Training in the Attachment of Children (ATTACh). I was introduced to Attachment Focused Therapy (AFT) and the work of Art Becker-Weidman, at my first ATTACh conference in 2009. I was struck then, and I continue to be amazed, at the depth of feeling and the generosity of spirit that infuses those who embrace this approach. The Attachment Therapy Companion is a must read for therapists working in the field and a primer for Attachment Focused Therapy. While ATTACh has previously published Hope for Healing: A Parent’s Guide to Trauma and Attachment as a guide for parents, those who seek more explicit details into the nature of AFT should read this as well. 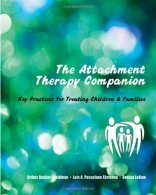 The Attachment Therapy Companion is not a text for the faint of heart but, rather, a clear exposé of the intense preparation, dedication, and empathy required of the therapist who engages in the specialized and demanding work of facilitating the healing of a child with disordered attachment. Weidman, Ehrmann and LeBow begin with an overview of AFT but quickly delve deeply into the core concepts and fundamental underpinnings of their work. AFT places the child/caregiver relationship at its core. While there are multiple layers of interviews, evaluations, and records reviews, both of parents, family members, and child, in preparation, it is the relationship, not the individuals, that is the focus of the treatment. The primary goals of therapy are to increases the child’s security of attachment, resolve the impact that trauma has had on the child’s development, and increase the caregiver’s capacity to create a secure base. The therapist becomes for the parent what the parent must become for the child: safe, attuned, and supportive. While a variety of techniques common to other forms of therapy may be used, “safety is always and at all times the over-arching pre-requisite” and a profound understanding of complex trauma informs this approach. Most parents seek intensive, attachment therapy as a last resort. Usually, they are exhausted from the struggle with a child whose behaviors have become increasingly overwhelming. They often feel isolated from, even ostracized by, those they thought would be there to support them. This may seem to them just one more in a long line of hopeless interventions. They feel discouraged and inadequate. Now, they are being told, you are going to work harder, dig deeper and participate more, than you ever have before. And yes, that may just be what it takes. Hello blogger, i found this post on 22 spot in google’s search results. This is major ranking factor nowadays. There is very handy wordpress plugin which can help you.